We’ve come a long way from the simple and boxy Ford Fiesta that I remember as a kid. 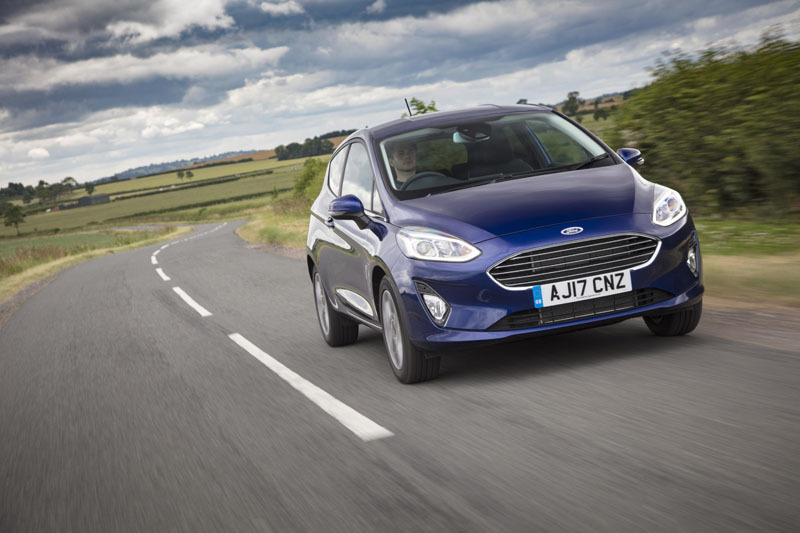 In 2014 the Fiesta was crowned the UK’s best-selling car of all time, Ford having shifted more than 4.1 million of them over the course of its 40-year history. But today’s Fiesta is a far cry from the basic shopping trolley of the seventies and eighties. In fact, this new seventh generation Fiesta almost has more kit and technology than a Mercedes S-Class from just a few years ago. Bristling with twelve ultrasonic sensors, three radars and two cameras, the new Fiesta is available with adaptive cruise control, forward collision warning, cross traffic alert, lane-keeping aid, traffic sign recognition, pedestrian detection with pre-collision assist, blind spot alert, auto high-beam, and automatic parallel and perpendicular parking. And there’s more: a heated windscreen, heated steering wheel, 675 Watt B&O Play sound system, voice control with emergency assistance… the list goes on. Ford claim it’s the most technologically advanced small car on sale in Europe and, as far as we can tell, they’re not wrong. 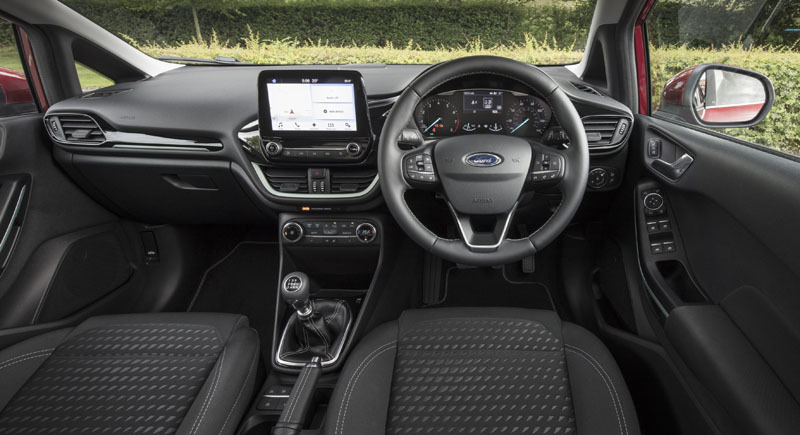 The range runs from the entry-level Style and Zetec, via the more upmarket Titanium, to the sportily-styled ST-Line and the range-topping Vignale with its quilted leather upholstery. 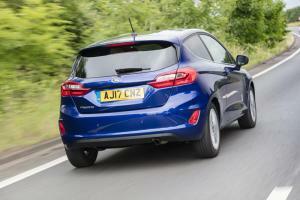 Not to mention the full-fat Fiesta ST and the pseudo-SUV Fiesta Active. Ford say they’ve tried to move the Fiesta upmarket with a more elegant design. Whether they’ve succeeded is perhaps somewhat subjective, particularly as we felt our Titanium test car looked a little ‘mouthy’ for our tastes, and we missed the kicked-up ‘training shoe’ rear of the previous model. 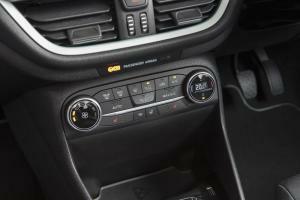 There’s no doubting the improvements to the interior, however, now dominated by an up to 8-inch touchscreen perched atop the dashboard. 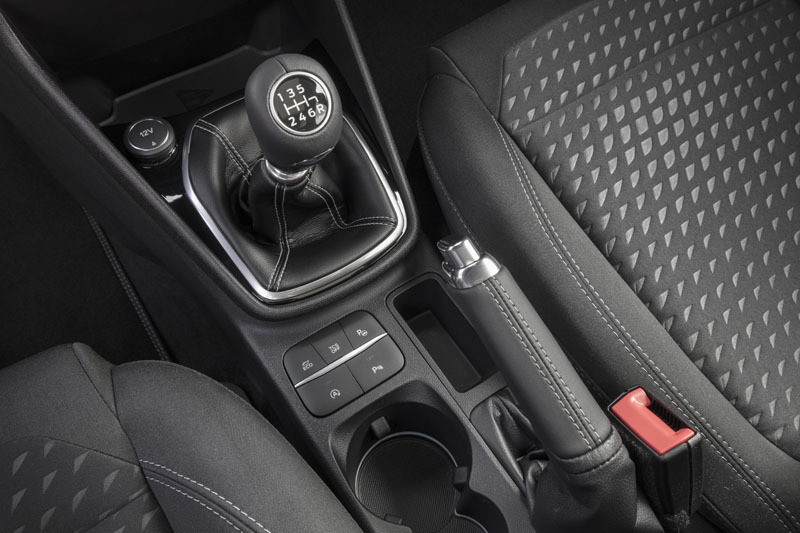 The leather steering wheel both looks and feels great, and we love the subtle ice-blue illumination of both the instruments and switchgear, repeated in the cup-holders and foot-wells. 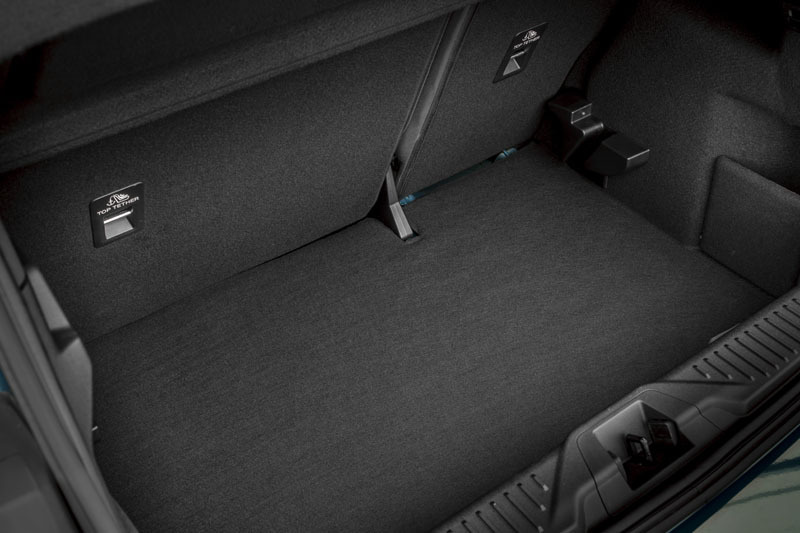 There are some areas where Ford’s efforts are less successful, though: the door grabs, for instance, feel hard and unforgiving, while the coin tray under the centre armrest isn’t quite the right size so it falls into the depths of the storage bin, taking your change with it. 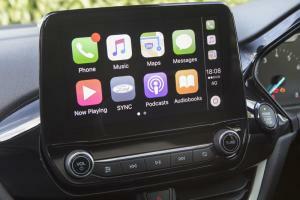 That said, Ford’s Sync3 media system is now pretty decent with high-res graphics and a good range of features. Models without built-in satnav do at least get Android Auto and Apple CarPlay, although we did notice the system still exhibited a bug we observed with the Ranger where an iPhone would have its ring volume set to maximum each time it was unplugged. The 10-speaker B&O Play sound system is easily worth the £300 Ford asks for it, with the company going as far as creating a pair of special editions in exclusive paint finishes for those that fancy something a little different. 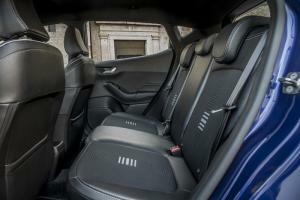 Ford say they’ve created 16mm more knee room for rear seat passengers, although it’s still a big ask to squish adults back here for any length of time, and while the tailgate opening is now wider, there’s still a substantial load-lip to contend with. Raw capacity is 292 litres, increasing to 1,093 with the seats folded. From launch, three engines are available, each in various states of tune: a 1.1-litre naturally-aspirated three-cylinder petrol offers 70 or 85ps through a five-speed manual gearbox, while the more likely 1.0-litre EcoBoost adds a turbo to develop 100, 125 or 140ps, delivered via a six-speed manual or an optional auto on the 100ps unit. A four-cylinder 1.5-litre diesel completes the line-up with either 85 or 120ps. We spent a week with the 100ps EcoBoost, during which its warbling, off-beat soundtrack accompanied a surprisingly competent level of performance around town. However, on the motorway it felt distinctly out of its comfort zone, quickly falling behind other traffic on even moderate up-hill stretches, exacerbated by what we felt was unnecessarily tall gearing. Where the Fiesta continues to score highly, though, is in its road holding. The steering offers a well-judged balance of stability around the straight-ahead but with encouragingly direct turn-in, no doubt helped by its new torque vectoring system. That gives it a feeling of calmness mixed with agility that makes it perfect both for a Monday morning commute through traffic, or a session on your favourite back-roads. It rides well, too, dealing with most bumps and undulations without troubling the occupants unduly, although we did notice some lateral pitching on fast, country roads that we imagine would be better dialled-out on the sportier models. Road noise over coarse tarmac surfaces occasionally spoilt what was otherwise a calm interior ambience, too. The adaptive cruise control worked well during our testing, smoothly decelerating as it detected slower vehicles in front whereas some competitors’ systems resort to throwing out an anchor at the last possible moment. We did, though, have to endure the odd false warning from the collision avoidance system which seemed easily confused by leading vehicles turning into side roads. 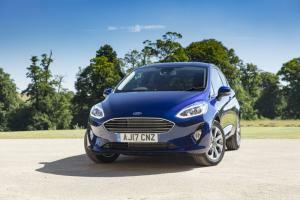 Prices for the new Fiesta start at £12,715 for a Style model with steel wheels, while a Titanium five-door starts from £16,795. Something more interesting such as an ST-Line with the 125ps engine can be yours for £16,645, while the 140ps version is only £300 more. 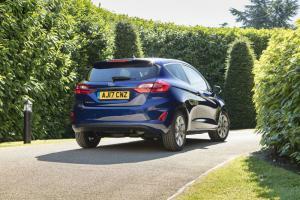 The world’s smallest gentleman’s club, the Fiesta Vignale, starts at £19,345. For a car with more safety gizmos than a previous generation Mercedes, that’s pretty impressive value for money. Plenty of new technologies, auto high-beam, heated steering wheel, blind spot warning, adaptive cruise control, etc.